We are Pantone Color Matching Experts. In-House Designer and an experienced production team. 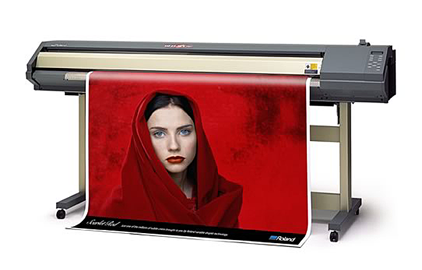 Banners, Posters, Window Clings and large-format promotional items are easy with our Graphics Department and varied choices for Oversize Color Output. Multiple media options include: Artist Canvas, Scrim Banner Vinyl, Photo Gloss & Satin, Matte finish papers, acetate, and watercolor stock. To ensure our output matches your original, color matching and correction are available as well. Our understanding of color and the various perceptions given media and print processes is unparalleled. We understand color on a professional level. Our Use of Pantone Color ensures exact matching for your project and superior print output. Exact color matching ensures uniformity to your work, whether delivered to us in person, or electronically. We work with a wide variety of media stocks and inks to ensure your work looks its very best. From archival quality papers, canvas and banner vinyl, to Glicee and UV inks, we have full-range capability. Ensuring your reproduced works match the original; color, depth, intensity and hue. We understand the relationship between the original work and a top-quality reproduction. Whether designing an original work, or reproducing existing artwork, we are detail oriented and check each project through many steps to ensure we have exceeded expectations and delivered above and beyond. Our Graphics Department can handle a wide range of projects. From designing logos and promotions 'from scratch' to enhancing existing products and graphics, to coordinating a branding image and marketable set of designs for print and digital mediums, our Graphics Department is there for you. Have a development presentation to make? Scanning, Color Correction, and Printing of Oversize Color on various Media. Scanning, Reproduction, Archiving and Finishing on Oversize Maps and Detailed Line Images. Creation and Design of Letterhead, Business Cards, Flyers, Rack Cards and Other Promotional Media. Scanning and reproduction of Artwork, Prints, and Multimedia. Scanning and Archiving of Artwork in Existing Frames. From CAD to Engineering and Survey Equipment, Rubber Stamps and Office Supplies. Our foundation is the Adobe series of products: Photoshop, Illustrator, InDesign, and others in the Creative Suite Collection. Adobe is the benchmark and industry premiere standard for designers. One of the biggest challenges is for a designer to translate their clients' vision into reality. Thankfully, with good communication and thorough knowledge of print and digital media, the gap between idea and reality is closed. Even if you have no firm concept or idea for the finished product, come discuss your ideas with us, and let us put our experience and creativity to work for you. How big can you print for me? We are happy to discuss any project with you to see what is involved, if we have access to media and what requirements our equipment and supplies merit for completion of your project. We also have outsourcing options we can provide for specialty or large quanitity orders. The composition photograph that you turned into a special poster for my parents was wonderful! So pleased! Amy L.
The post cards you did from my photographs were beautiful, and garnered such compliments and praise!Robert G.
I was amazed at the print quality you obtained in creating an oversized canvas print for my business.James K.
The birthday banner we had for a friends' 40th roast was spectacular. It made her day.Tia S.
We were able to archive so many of our photos and data to where it was easier to catalog and find things. Thank you!Carter B.
I could not tell the difference between my watercolor originals and your printed copies! Thank you!Jean M.
After checking elsewhere and having things done incorrectly, I was so thrilled that my project came out perfectly with your staff support!Angie R.